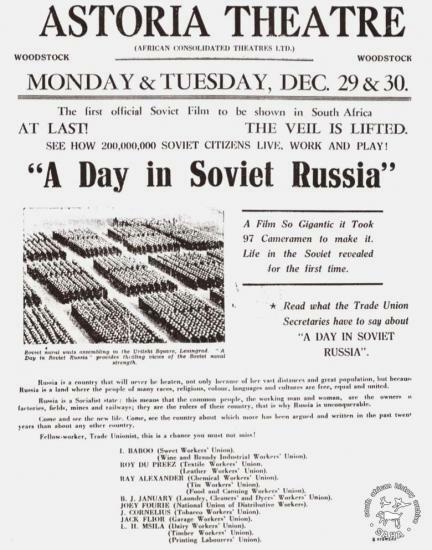 SAHA - South African History Archive - Pamphlet advertising the film "A Day in Soviet Russia"
Pamphlet advertising the film "A Day in Soviet Russia"
Title: Pamphlet advertising the film "A Day in Soviet Russia"
Description: This pamphlet advertises the film "A Day in Soviet Russia" at the Astoria Theatre in Woodstock, circa 1940s. 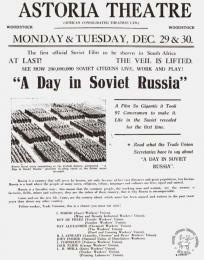 The Friends of the Soviet Union (FSU) showed films like this one. This pamphlet is reproduced on page 47 of Julie Frederikse's book 'The Unbreakable Thread: non-racialism in South Africa' originally published by Ravan Press in 1990. Included in SAHA's online edition of the book and in the virtual exhibition 'Tracing the unbreakable thread: non-racialism in South Africa'.